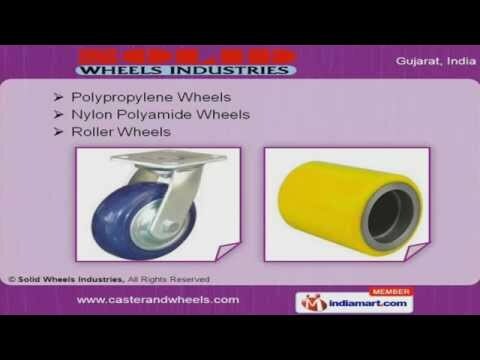 Welcome to Solid Wheels Industries Manufacturer & Exporter of Heavy Duty Trolley Wheels We are an ISO 9001:2008 certified company, Established in 1998 at Ahmedabad, we serve to Chemicals, Pharmaceuticals & others industries. Well equipped R&D units, competitive prices, timeliness & free sampling policy are some of the key factors behind our success. Our UHMWPE, Polyurethane & Cast Iron Wheels are fabricated from premium grade raw materials. We provide Polypropylene, Nylon Polyamide & Roller Wheels that are setting a performance standard in the industry. Thermoplastic Polyurethane, Cast Nylon & Polyolefin Wheels are some of our best selling products. Along with that we provide Medium & Heavy Duty Wheels that are a class apart. Our UHMWPE & Polyurethane Wheels For Textile Industry are widely acclaimed in the market. We also offer high quality Material Handling Equipments and Low & Medium Duty Wheels. For more information.